At Varadero beach tourists can walk several tens of meters from the shore without being completely covered by its waters. The sand is absolutely white and the water offers a wide range of colors - from blue to green. Varadero's depths have more than 40 types of corals and a wide diversity of fish, as well as lobsters, shrimps, crabs, caguamas and more than 70 types of mollusks. Varadero's diving area - with more than 25 specific sites - stretches from Matanzas bay to the western section of the Sabana-Camagüey archipielago's keys, including the impressive Ojo del Mégano blue hole, a 70m underwater cave in the coral reefs of Cádiz bay. As the greatest beach resort in Cuba, dozens of hotels from 2 to 5 stars cover the 30km of the first rank of the beach, many of them ALL INCLUSIVE and with beautiful pools to alternate with the sea. Restaurants, night clubs, a professional golf field, a submarine, yatchs, all types of water sports and many other attractions justify the remarkable fame that Varadero has all around the world. An international airport has been constructed just 20km away from Varadero, where big size airplanes of trans-oceanic flights directly connect it with the whole world. 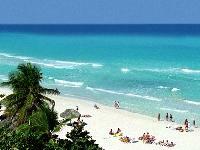 You may even visit Havana (150km away) for a one-day or overnight journey.